Offer: to take us up on this offer present this Ad to the Fresh Reception Team and start your FREE Gym training session. 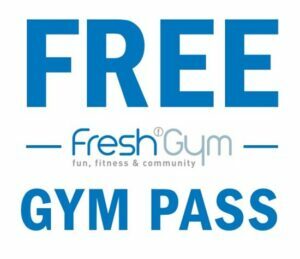 Terms and Conditions: 1 Day Gym Pass per person. Offer is for Gym session and excludes classes. Guest must be a first-time user of Fresh Gym. This offer cannot be exchanged for cash or another product. Fresh reserve the right to refuse this offer.